How To Watch Canelo Álvarez vs Daniel Jacobs Live Online ? Canelo Alvarez is set to take on Daniel Jacobs in massive Super Middleweight unification title fight which takes place on Saturday night, 04 May 2019. Canelo is coming into this fight on the back of signing massive 11 fight $365 million DAZN contract and Daniel Jacobs also did the same albiet just a 3 fight deal which kicks in from January 2019. Alvarez will be hoping to add IBF title to his collection which is currently hold by Jacobs. 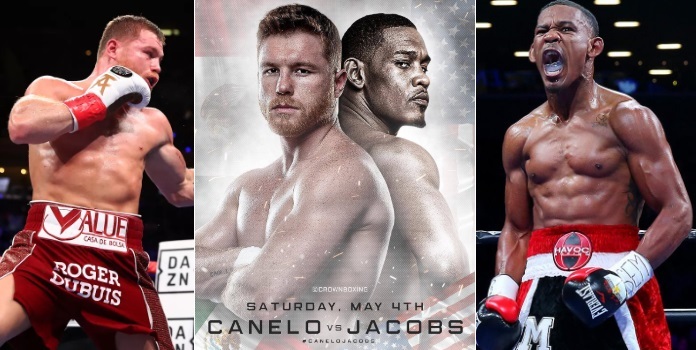 Canelo Alvarez vs Daniel Jacobs TV Coverage Details: Canelo Alvarez vs Daniel Jacobs takes place on Saturday, 04 May 2019 starting at around 09:00 pm ET US / 1:00am UK time. The US viewers can watch the fight live online through DAZN who will be broadcasting it only through streams and it will be the second fight in 11 fight agreement between Canelo and DAZN. UK viewers can get the fight live on Skysports Main-Event (Non-PPV). There are several quality undercard fights which will be announced a month before the fight. Coverage Starts DAZN has the exclusive rights to show Canelo-Jacobs coverage in the US and US Viewers can get the fight live through DAZN’s online streaming service. PPV Coverage PPV coverage begins at 09:00 p.m EST at DAZN with the first of four undercards fights schedule on the night. Its a massive fight which boxing fans have been looking forward to Daniel Jacobs has overcome bone cancer of all things and went on to win IBF middleweight title now he is hoping to go against the odds again as he takes on Canelo Alvarez in what should be a cracking fight. 118/110 what was Adalaide Byrd smoking?